So...the entire family...(3 kids, DH and the dog!!) went away for two nights/3 days!! It was absolutely wonderful! In a summer that has been mostly rain, we had wonderful weather! No internet, no TV, no phone (except for cell in emergency)...and home cooked meals in the cabin! Here are a few highlights of our little trip (we were only about 2 hours from home). Canoeing at the cabins......this photo is my two daughters, my son went as well, only later, and I didn't get a photo. The three of them together at the waterfront. This is right at the edge of town, you can see how close some of the houses are! My girls staring at some black cows...staring at them! LOL....look at the view these cows have!!!! My 3 walking on the beach! This beach and surrounding area are popular for fossils. Have a great day everyone!!!! I am trying to get things organized for a two day vacation this week...can't wait!! The entire family will be going! Okay, in the frame (which is like a little cabinet (opens on the side)....is a post card my grandmother sent to my grandfather in 1945...she was away on a little vacation to Boston....a key to their barn, a photo of my grandmother and grandfather around the time they got married...(1908)....a photo of their oldest child....who would be 101 now......a tin photo of my grandmother, which was given to me years, and years ago...she was about 2....so it would be about 119 years old....and a tin photo of my grandfather's two brothers when they were little boys...well over 100 years old!! And, a gold bracelet/locket of my grandmother's......with her name engraved on it...and what looks like teeth marks in it!....LOL...I envision her wearing it and her kids (8 of them) chewing on it when she is rocking them or something.....will never know actually how those marks got there....but...still...... I absolutely love looking at this in my dining room/den! It's so much better then having these things stored in a box somewhere! The kids love it too and are always showing their friends and telling them about it! 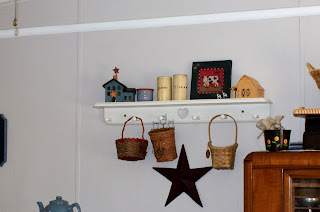 And, as I mentioned a while ago..we painted our kitchen...so I changed things around in it. I tried to get some photos of the curtains I made, but it's too sunny out at the moment...anyway, I found this shelf at the Thrift Shop! Already painted!! I also found the star (75 cents) and I painted it the colour I wanted it....I found the baskets at various Thrift Stores...and the little blue house with the star on top....25 cents!! I love searching for bargains!!! I also think this looks really nice in our newly painted kitchen!! I have been stitching.....I can't seem to get good photos of my stitching though!! Any ideas what I am doing wrong? Here is what I am working on...I am loving it!!! It is called "The Sheltering Tree" by "With Thy Needle and Thread"...and I am stitching it over one. What a sweetheart to give this away!!! Have a great afternoon everyone!! I will do a post as often as I can in the summer, and hopefully my Blogging fever will return one of these days. Well, after a winter of about 18 snow storms, our summer has been rain almost every day! And also a lot cooler than usual!! We manage to squeeze in some fun when we can thought. I have booked a cabin for all of us (including the dog! LOL) for a couple of weeks time...it will be a really nice family getaway for a couple of nights. I've already mentally started packing and preparing the meals. My youngest has been enjoying camping most weekends with my oldest DD's boyfriend's family. He has a sister the same age as my youngest, and they are best friends. My son is bored...he's 15 and this is his last summer to "hang around"...he'd love to have a job, but most places won't hire until 16 and the few that hire at 15 aren't hiring. I've been giving him things to do around here and pay him a bit periodically for the extras...so that helps. I asked him to make me a little chair for my garden....this is what he came up with...isn't it nice!!!! Anyway, must go....I'm off to Starbucks in a bit to have coffee with an old friend! Have a great day everyone!! It has sadly been one month since I have updated my blog. I have been reading my favourite blogs for the most part, but the blogging fever has not picked up for me. I am sorry that it has been so long....I am around on Facebook a lot and that seems to be my main focus at the moment. A lot has happened in this past month. I now have a High School Graduate! I now have a Grade 6 Graduate! It has been a busy month for sure! Oh and I now have a 12 year old! I always feel like Canada Day (today) is the beginning of summer. In a bit we are headed to our neighbours for their annual Canada Day Breakfast that they do for all the neighbours around here.....tonight, weather permitting we will head into the fireworks. I am not sure if they are still going to have them or not, as it has rained here for several days and today is not different! Bummer! So, what do you think, should I continue the blog....anyone care..